The second year, expected to fulfill the hopes of the first season, didn’t happen the way it was supposed to. With many changes in the leading parts, certainly lacking pizzazz, with a downgraded show, the 1958 Cotton Club Revue had also had to face bad luck. Even the GONE Album recorded to support the show was released right after the closing of the engagement in Miami… But it takes much more to dishearten Cab Calloway! In mid-December 1957, the cast of the revue for the new season is announced: naturally Cab Calloway is still the star of the show. Singer Mauri LEIGHTON replaces Sallie BLAIR. Jimmy RANDOLPH of TV fame (he appeared a couple of times!) will be the new Lonnie SATTIN. Norma MILLER and her dancers are back on duty. The Four STEP BROTHERS are drafted as extra added attractions. The company is enhanced by the young prodigies of tap: The HINES Brothers, Maurice and Gregory. When Cab died in November 1994,Gregory Hines remembered being 11 years old and performing with Calloway: “It was such an honor to be around Cab Calloway. His dressing room door was always open. I just wanted my hair to look like Cab Calloway’s. I would put my underwear pants on top of my hair.” (in The last, loving goodbye to ‘Hi-di-hi-di-hi-di-ho’, The Baltimore Sun, Nov 30, 1994). Comedian Slappy WHITE is back in front of the curtain. Malcolm DODDS and The TUNE DROPS succeed The Orioles. Dancing couple Paul MEERES, Jr. (or Meers) and LaRAINE (or Loraine) entertain the audience with a torrid number. For this season, the choreographer is not Clarence Robinson but Lee SHERMAN (1914-2012). Sherman was known for his choreographies at the Roxy Theater in Manhattan and for his experimental mixing of jazz and modern dance, an innovation in the Forties. When you look closer, the cast includes many artists who had appeared in the Larry STEELE’s revue, Smart Affairs of 1958 that played at the Dunes in Las Vegas (Mauri Leighton, The Hines Kids), plus Paul Meeres and LaRaine from Timmie Rogers’ revue. The new revue appears to be here to stay indefinitely in Miami, before going on tour to Chicago, Detroit, ending in Las Vegas, like last year. And the finale Never Had It So Good sung by Malcolm Dodds and the Tune Drops and the entire Cotton Club cast. Performances are 6 nights per week at 8:30 and 11:30 and a third show on Saturday at 2:00 am… Quite intense rhythm, isn’t it? On February 15 the Pittsburgh Courier affirms that this year’s revue is even better than last year’s. But here comes trouble, beginning with Eddie BAREFIELD who breaks his leg after falling. He remains conducting the orchestra and he seems to be treated well by his colleagues, as this JET picture testifies (Feb 13, 1958). In March 1958, however, the Miami Beach show closes due to the business falloff. Rusty WEINGER, Murray’s widow wishing to focus on public relations. But the reasons for the closure of the Cotton Club in Miami are to be found elsewhere than in management. This is the catastrophic weather of spring 1958, that scared away tourists throughout Florida: the rain succeeds a terrible fog (we could believe that the weather curse was on Cab since 1952 when, while the troupe was touring in London, thick and freezing fog had descended on the capital, causing many fatal accidents and preventing people from making it to the theater). Miami bar and hotel owners indicate at least 20% decrease in activity. An unusual glacial cold suddenly fell, "I felt like a pecan in a Sundae" reports Fred Sparks in The Evening Standard (17 February 1958). 36 or even 26 ° F (or 2 ° C and -3 ° C) temperatures indeed eliminate any idea of going sunbathing. And even less to attend a review. On February 17 it is expected that the Cotton Club would close its doors. So it will be done early March. Nevertheless the end of March brought the famous GONE album "Cotton Club Revue of 1958" to which we have already devoted a whole article. “The show must go on” for Cab! On March 28, 1958 marked the death of the composer W. C. HANDY, considered "The Father of Blues" and the author of the famous "St. Louis Blues". Cab so often sang that song as many others from the great songbook that Handy entered the collective memory. 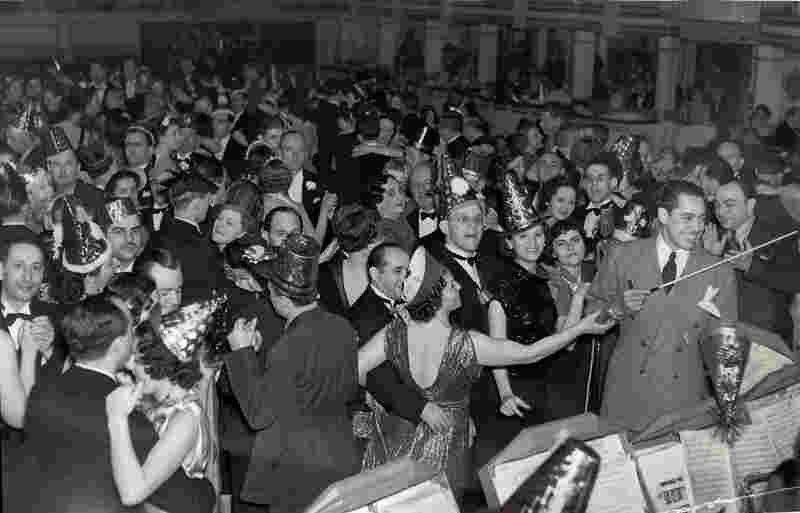 Cab had even shared the stage at the Manhattan Cotton Club for a whole season in the Thirties with Handy and had officiated as Master of Ceremony celebrated his 75th birthday at Carnegie Hall in 1938. He attended Handy’s funeral in Harlem on April 2 along with the likes of Noble Sissle, Eubie Blake, Cozy Cole, Marian Anderson, Langston Hughes, Oscar Hammerstein, Irving Berlin, Ed Sullivan, Johnny Hodges... and more than 150,000 people who follow the procession that day. On April 5, 1958, Cab is the guest of the Canadian TV show "Cross Canada Hit Parade." He sings "St. Louis Blues". The eponymous film will be released on April 7 and Cab takes the opportunity to promote his movie, despite the fact that he has a non-singing role in it. On the contrary, he’s even the "villain" of the story. The film was shot in the Paramount studios in Los Angeles in October 1957. There he has played with his buddy Nat King Cole (see our article and video on our Facebook wall) and also Eartha Kitt and Ella Fitzgerald. Always ready to entertainer and knowing that he's always welcome in Canada, Cab plays at the Gatineau Club in Gatineau, ONT. between April 7 and 12, with 2 shows nightly. A place where he has already come in 1951 with Dotty SAULTERS. The announced Cotton Club Revue has nothing in common with the one Cab left in Miami. He doesn't have his own orchestra there and sings backed by the Wally MUNRO orchestra. Then, from 4 to 13 May 1958, Cab is on the Koko restaurant stage in Phoenix, Arizona (he already toured there in July 1956). Arthur BLAKE and Carol JASON are also on the bill. Despite the setbacks, Cab is not discouraged, and between May and early June 1958, he goes to France for a few weeks at the Olympia (see our article). There, it's not the weather but the political events with numerous demonstrations (related to the independence war in Algeria) and bloody clashes with police that will shorten his engagement from a week in the temple of the French variety. The day after his last concert, he flies to Switzerland with his wife Nuffie at the invitation of his friend the cartoonist Ernest Simms CAMPBELL (of the famous 1932 map of Harlem) who lives there with his wife. Together they will attend a concert by Dizzy GILLESPIE with whom they spend the late evening until the wee hours the next morning. From Geneva, they leave directly for the US. The Cotton Club revue being still on stand-by in August 1958, Cab again plays the role of Sportin’ Life in Porgy and Bess for a new series of performances. The live production is allowed to tour only until the release of the Otto Preminger’s movie. Afterwards, they won’t be allowed to perform at the same time. Cab is never on stand-by! The tour takes him to Oakdale (10-17 August), Boston (18-25 August). Cab even manages to get an increase in salary. It must be said that without the big names Leontyne Price and William Warfield, Cab Calloway is now the single remaining star of the company. As usual, many thanks to Keller WHALEN for his help, support and contributions on this article!